A civil society organisation, Lawyers United Against Corruption‎ (LUAC) has called for the suspension from the Senate, arrest and prosecution of Senator Andy Uba, over alleged ‎academic certificate forgery, perjury and indictment for looting public funds. In a petition to the United States and United Kingdom governments through their Embassy and High ccommission in Abuja, respectively, the organisation said it is determined to expose desperate politicians, public office holders and moneybags who are enemies of the war against corruption vigorously being fought by President Muhammadu Buhari, GCFR. ‎In a petition dated 17th September 2018, LUAC, through ‎Josiah Ojenya, Esq. ,‎Chief Convener, ‎said its recent investigation reveals that on 26th November, 2008 after careful consideration, the Home Secretary personally directed that Senator Emmanuel Nnamdi Uba (alias Andy Uba) who presently represents Anambra South Senatorial District should be excluded from entering the United Kingdom because his presence thereat was alleged not to be conducive to the public good due to his character, conduct and association with fraud and other criminal activities. LUAC said in a bundle of document which also contained the petition said the Home Office had at all material times seen Andy Uba as an impostor in relation to his academic credentials, hence the making and maintenance of the Exclusion Decision against him. "Documents obtained by our members show that Andy Uba has systematically lied about every level of his academic experience, brazenly doctoring his secondary school leaving certificate and laying claims to several university degrees, including a doctorate, even though he never obtained even a bachelors degree. 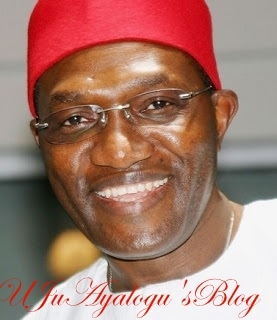 "‎It may interest you to note that Andy Uba who was originally known and addressed as Emmanuel Nnamdi Uba, completed his secondary school education at Union Secondary School (same as Boys High School), Awkunanaw, Enugu, the capital of then Anambra State, in 1974. Copy of his School Leaving Testimonial is attached as ANNEXURE B. His Statement of Result shows that Andy Uba sat for nine subjects namely; English Language, Literature in English, Christian Religious Knowledge, Economics, Mathematics, Physics, Chemistry, Biology and Statistics. The Statement of Result which contained Andy Uba’s Examination Number 05465/089 showed that he failed Literature in English, Christian Religious Knowledge and Economics, obtained Pass Grades in English Language, Mathematics, Physics, Chemistry, Biology and Statistics while he earned Credit Grade only in Chemistry. Copy of the Statement of Result is hereby attached as ANNEXURE C.
"However, Andy Uba forged a different Confirmation of Result dated 21st November, 2013, claiming that the same was issued by the West African Examination Council (WAEC). In the said document Mr. Uba offered a rosier picture of his academic performance by stating that he obtained grades to wit; English Literature 4, English Language 7, Religious Knowledge 7, Economics 4, Statistics 6, Mathematics 6, Physics 5 and, Chemistry 6. Below the forged document, which Andy Uba apparently presented to the UK Border Agency in London, was the curious message “You will have to satisfy yourself that he/she and UBA EMMANUEL NNAMDI of our records are one and the same person”. The document which gave Andy Uba’s address as 14, Vaal Street, Maitama, Abuja was purportedly signed by one Oshunbote S. (Mrs.) as “Results and Certificates Officer”, and Okelezo A. A (Mr.) for “Head of National Office”. Copy of the letter referenced L/CR/CONF/05465089 and titled “CONFIRMATION OF RESULT” is attached as ANNEXURE D.
"We are also in possession of another forged WASC/GCE School Certificate with Candidate No. 05465089 and Certificate No. SC544753 that Andy Uba had used to misrepresent his mediocre performance in secondary school. Copy of the Certificate is attached as ANNEXURE E and the results contained therein were fraudulently doctored to tally with those in ANNEXURE D. Meanwhile, in a letter dated 12th February, 2014 WAEC replied to an enquiry by George Smith, a UK based Private Investigator practicing under the name and style of Public Agencies, stating that both documents are fake. The response detailed that the examination conducted in May/June 1974 was GCE and not WASSCE as indicated on the Confirmation of Result. Furthermore, for a candidate to have been qualified for a First Division Certificate under the WASC/GCE regime, he/she must “have passed in at least six subjects selected in accordance with the Regulations, reaching Credit in at least five of them (including English Language)”. LUAC said the results listed by WAEC as belonging to UBA EMMANUEL NNAMDI are the same as those contained in the authentic Statement of Result, that is, ANNEXURE C.
Ojennya said the Deputy Inspector-General of Police, Force Criminal Intelligence and Investigations Department (FCIID), on his part, whilst investigating a case of Criminal Intimidation, Criminal Breach of Trust, Forgery, Using as Genuine a Forged Document and Threat to Life reported against Andy Uba, wrote to WAEC vide a letter dated 2nd May, 2017 to confirm the authenticity or otherwise of both the Confirmation of Result and School Certificate. The letter signed by CP Moses A. Jitoboh is attached as ANNEXURE G.
‎LUAC also accused Uba of intensifying the falsification of his academic credentials beyond secondary school. "At a point the man authorized the posting of an educational profile on his official website www.andyuba.blogspot.com that is far from the reality on ground. Andy Uba named Concordia University, Montreal, Canada; California State University, USA, and Buxton University, UK as institutions where he obtained degrees. The entries in Mr. Uba’s website portrayed him as having earned a “Ph.D in Biological Sciences” at Buxton University. Ojenya said according to his official website, Mr. Uba who had further academic studies at the California State University, USA later proceed to Buxton University, UK where he earned a Doctorate Degree in Bio-Sciences in 1996. Copy of the Buxton University Doctorate Degree Certificate is attached as ANNEXURE J. A careful look at Mr. Uba’s page on the official website of the National Assembly paints a more muddled picture, reflecting the Senator’s desire to further mislead the public about his academic credentials. The page lists St. James Primary School in Uga and Union Secondary School, Awkunanaw, as two of three institutions attended by the Senator, with “CALIFONIA STATE UNIVERSITY LOS ANGELES” as the third. However, the page leaves “date of graduation” from the primary and secondary schools blank. It also claims that Mr. Uba obtained “WASC” (West African School Certificate) from both the elementary and secondary schools. This is indeed ridiculous! "In what looks like an acrobatic dance, Mr. Uba however omitted to list Concordia University and Buxton University on his official Senator’s page. This is because he knows that the certificates he parades as having been awarded by those Universities are fake. As a matter of fact, we can authoritatively confirm that Andy Uba does not have any Bachelors Degree from Concordia University (formerly Sir George Williams University) - a Canadian institution he claimed to have attended. The records indicate that he dropped out prior to completing the requirements for the award of a Bachelors Degree. The university’s alumni office of records told our investigator that Concordia University has no record of Andy Uba ever graduating from the school. "It has been shown that Andy Uba was never a graduate of California State University either at the Bachelors or Masters Degree levels. He was first enrolled at the school for an undergraduate program from March 1985 but he dropped out in March 1987 and then re-enrolled on 27th September, 1990 till 21st March, 1992 when he dropped out again, and never graduated. We submit that the claim by Mr. Uba that he graduated from California State University, leading to an award of Bachelor of Arts Degree in Geography and Urban Analysis attached as ANNEXURE K shows the absurd lengths to which he went to lie about his studies. Several major media platforms in the United States of America and elsewhere, including the Washington Post, have reported that Buxton University was never a university but a sham, once based in Portugal, but ceased operations since 2011, that sold all levels of “degrees” to anybody willing to pay a small fee. "Since Mr. Uba has no certifiable first degree, the idea of his holding a doctorate is, on the face of it, fraudulent. Buxton University was an unaccredited institution that was notorious for awarding bogus degrees to clients like Mr. Uba. Our check on Wikipedia throws up the irregularity of the doctorate “degree” Mr. Uba claims to hold. According to an entry on Wikipedia, he studied at California State University and then Buxton University, gaining a Ph.D in Biosciences in 1996. The assertion by Andy Uba that he was awarded Honourary Doctorate Degree in Public Administration by the Nnamdi Azikiwe University Awka in 2009 attached as ANNEXURE L becomes more questionable. It smacks of desperation to cover the gaping holes in his past claims to having earned academic degrees".